I’m recently back from a week in Cedar Key, Florida. It’s become, over the course of five or so years, one of my favorite places. Driving the last leg of the trip down the long straight highway that leads only to the town of Cedar Key, poised like a diver on the end of a pier, everything in me relaxes. It is a place to go to be quiet. I’ve been there enough times now to begin to imaginatively interact with the place and its history. The collection of islands that used to be called the Cedar Keys is located about halfway between Tallahassee and Tampa, on the west coast of Florida. Cedar Key was a thriving town in the late nineteenth century after a railroad was built linking its port to the east coast of Florida. Ships from the west coast of the U.S and south and central America docked there to offload and pick up goods. The area itself was so rich in cedars that Eberhard Faber set up a pencil factory there--in the process pretty much wiping out most of the cedars the area was named for, although a few old ones still stand around town. With a year-round population of under a thousand and an economy now based on clam farming and tourism, including boating and birding, Cedar Key has a back-in-time feel. You rarely get in the car because you can walk from just about any place you’re staying to anywhere else in town. Bikes and golf carts are the primary modes of transportation. Arriving at night on the next to last day of the year, the only sound was from the little tree frogs called peepers, up in the pines. In the morning, at low tide, the sound was of some great beast sleeping, a filled silence. Perhaps this pregnant quietness is conducive to daydreaming, to feeling oneself adrift in time. At the Island Hotel, which as a structure dates to 1859 (and which incidentally has a wonderful bar), it’s not hard to imagine ghosts from the turn of the century brushing past you in the dining room. 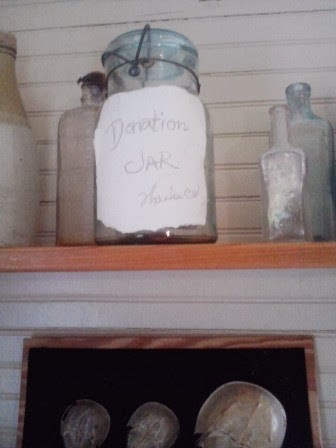 At the Cedar Key State Museum, you can tour the home of St. Clair Whitman (1868-1959), a naturalist and collector whose house was saved, moved, and restored by town residents. I’d been there once before but wanted to go back to immerse myself in the feel of the house: wide heart-pine planks throughout; an arched doorway leading into the dining room and a place where the wood squeaks when you step through that doorway; in St. Clair’s study and display room, hundreds, maybe thousands of shells organized by type and stored in individual cigar boxes on shelves; family photographs scattered throughout the house; a sense of simplicity and peace, a clarity of light. The house once looked out over Goose Cove on land now named Whitman Point and occupied by townhouses and condominiums, but you’d be hard put to say the land’s been spoiled—nothing on Cedar Key is over three stories high, and trees, pocket parks, benches, and seasonal plantings create a sense of welcome and of a place that people care about. Artists come here to visit or stay. There’s a sense of privacy within friendliness. The woman at the checkout counter in the town’s small grocery store is reading a story by Lorrie Moore in Harper’s. The history of the place, as with the history of all places I suppose, has its dark side. Settlement of the area by whites was encouraged by the U.S. Congress as a way of removing Seminoles from the area. In 1923 the majority African-American town of Rosewood was destroyed in a massacre that began with the lynching of a black man being questioned about a supposed attack on a white woman from nearby Sumner. The African-American women and children of Rosewood eventually escaped on trains while the men stayed behind to defend their homes, but the mob of Klan members from Gainesville combined with local whites burned the town to the ground. It was many years later that reporters and scholars began to tell the story of Rosewood to the larger world. Alabamian Bill Cobb has written of this area in his novel The Last Queen of the Gypsies. Cobb’s protagonist Minnie, abandoned by her family as a child, is for a time taken in by an older black couple who survived the violence and returned to Rosewood. Minnie later works for a time as a prostitute in the "Coronado" Hotel in Cedar Key before going on to other adventures. I have a feeling I’ll be writing something, too, although I’m not sure yet what it will be, not even sure whether it will come out as poem or story or nonfiction. To the degree that I understand the process, it’s often a combination of strong sense impressions and intellectual engagement that makes me want to write about a place or event. I begin to imagine what people thought and did—for instance, what did St. Clair Whitman think about the events occurring down the road in Rosewood?—and I follow the trail to see where my curiosity about places and people and my own obsessions meet up.